During your day-to-day- activities, you may need to share specific information with a user, a group of users, etc. For example, you may want to share a deal with a sales rep, or the sales manager. Or you want to share your Mailbox with another user; you want another user to send emails from your Mailbox, see incoming emails, manage folders and so on. In Flexie CRM, you can share records such as leads, deals, contacts, accounts, cases, custom entities and even your mailbox. The idea behind sharing records is simple and empowering at the same time: allow you to share vital information with other users, get valuable feedback and allow them to take action whenever you see it necessary. Sharing records in Flexie is simple and quite intuitive. To illustrate this with an example, let’s say you want to share a deal with a user or group of users. First, go and click the Deals button on the main menu. Here you can see all the deals and the stages they’re in. To share a deal, first go and find the deal you want. You can use filters to find the deal you want to share.You can search by name, amount, closing date, owner, created, etc. This comes especially in handy when you have a lot of deals in your pipeline. Once you find the deal you want to share, just click on it. Here you see all the details related to the deal you want to share. Next, go and click the Actions button. Here you can choose to share the deal with a specific user, a group of users or with a user who has certain permissions. Let’s say you want to share the deal with a specific user and a group of users. Select the user you want to share the deal with and the group of users as well. Next, click the Save button. You’ve just shared the deal. The user and the group of users you just shared the deal with can see all the details about the deal. 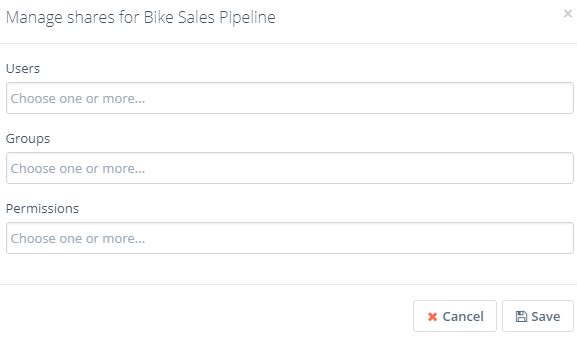 In addition to deals, you can also share leads, contacts, accounts, custom entities, cases and your Mailbox. Sharing records can help you increase efficiency within your company, resulting in more time spent solving problems and less time spent on administrative tasks.